Our Tuscan paradise Borgo Santo Pietro is bursting with charm, style and natural beauty. This also manifests itself in the amazing food it serves. Food so delicious it’s a blog post all on its own, so here goes. Beautiful pictures for you to salivate over. There are two restaurants at the hotel. The Treehouse is for fairy-tale-like alfresco dining, open for lunch and dinner every day. It’s a magical place with a beautiful treehouse (at the base of a huge tree) where you can snuggle up beside the real fire on chillier days. 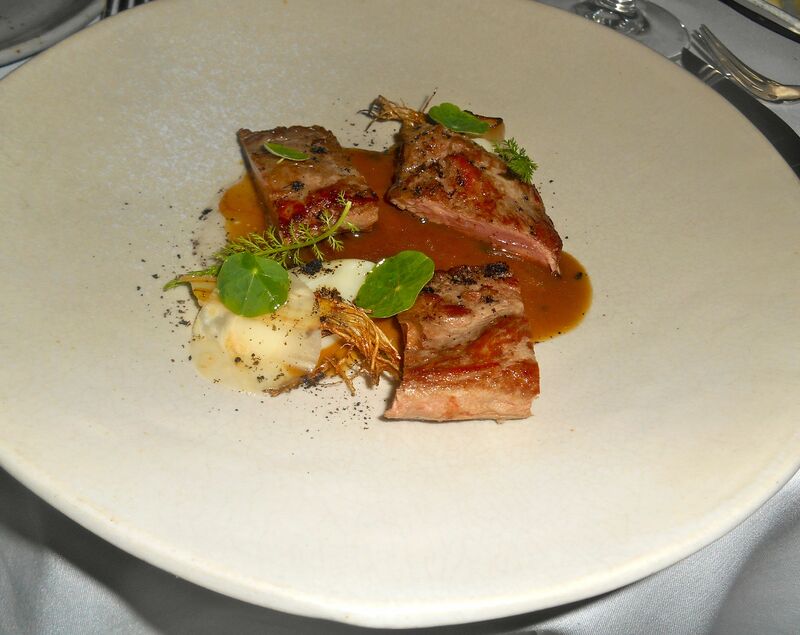 The lunch menu offers simple fare perfectly prepared and served with flair. 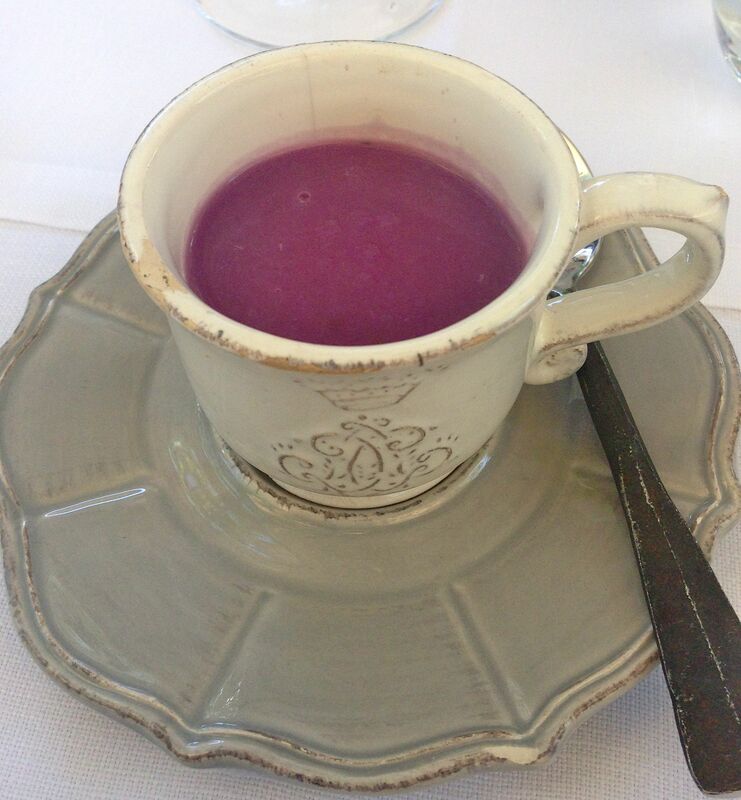 Like this beautiful beetroot soup. 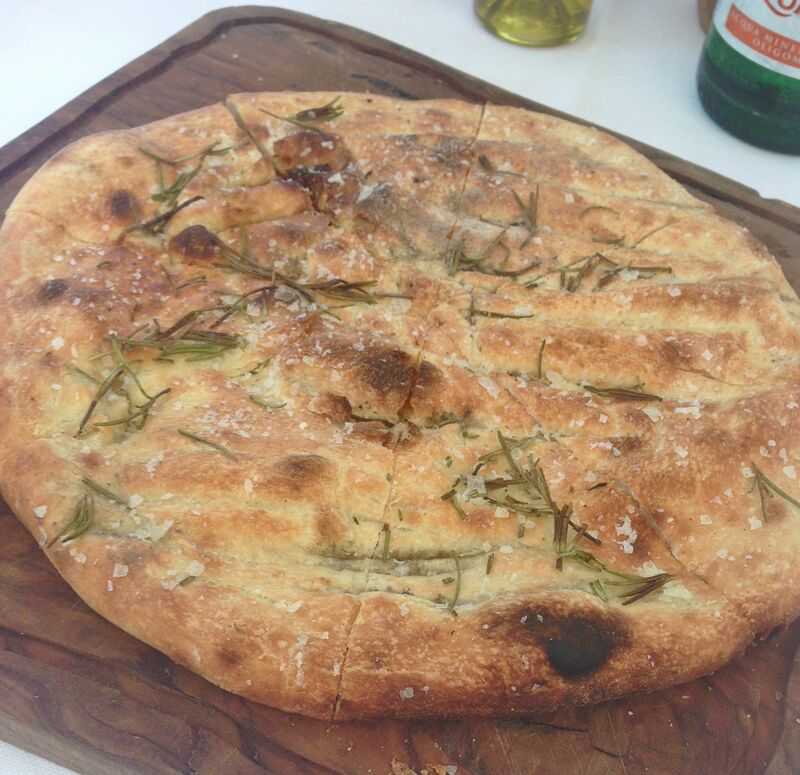 There’s a traditional pizza oven which is also used to make bread like this delicious offering sprinkled with fresh rosemary from the gardens. Borgo has a substantial vegetable and herb garden as well as orchards, so plenty of fresh produce to revel in. Tuscan olive oil is fabulous, too. Borgo Santo Pietro’s own blend has a surprising spiciness, perfect for dipping your warm, straight-from-the-oven bread into. 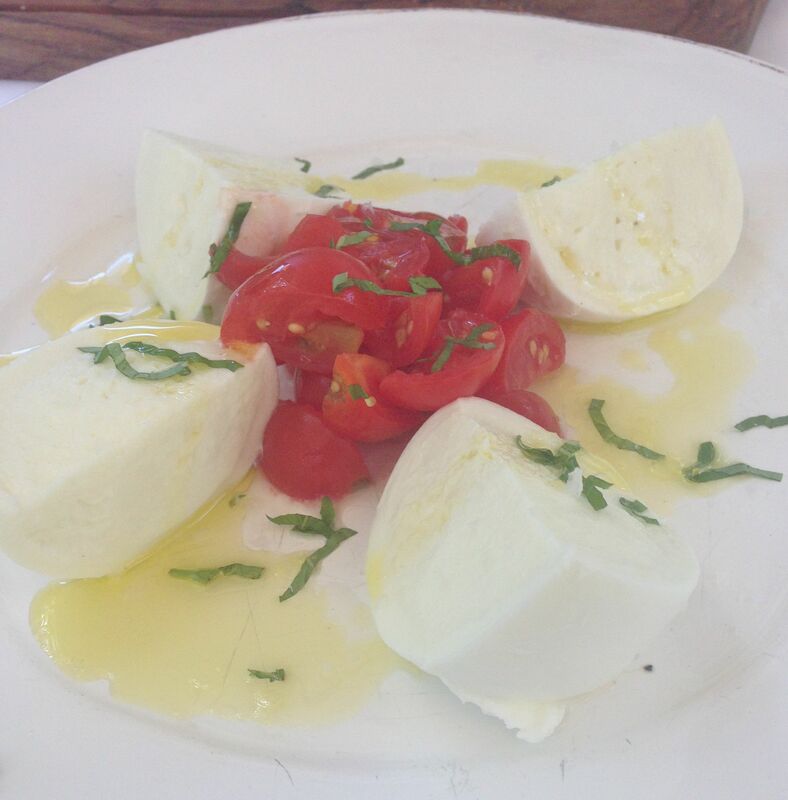 When in Italy, sample the Caprese. Well, we are in the land of tomatoes, basil and buffalo mozzarella so it’d be wrong not to. My goal: to sample Caprese in as many parts of Italy as I can, I know I do try to test myself. And dessert – yes, even at lunchtime. Italian desserts are hard to resist. 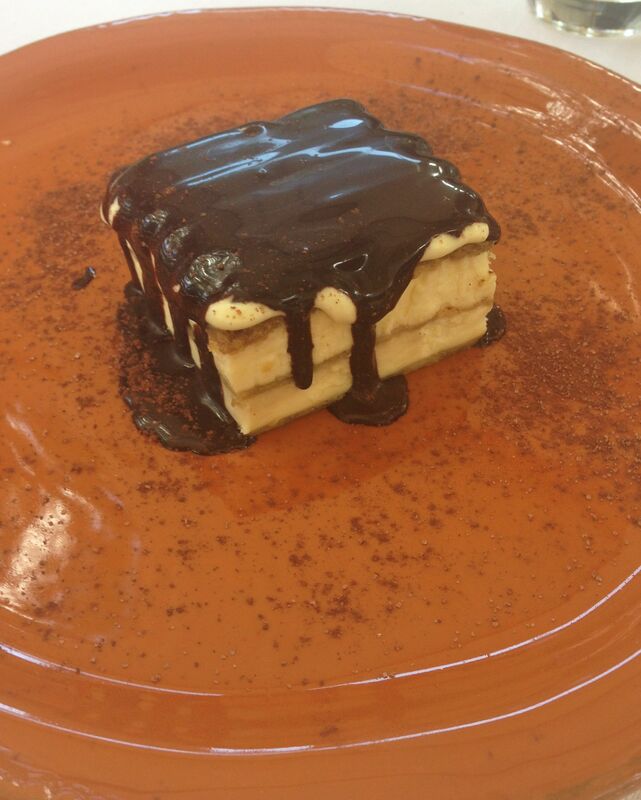 This melt-in-the-mouth tiramisu was topped with rich chocolate sauce. Decadent. On Monday nights The Treehouse hosts a Farmer’s Market. 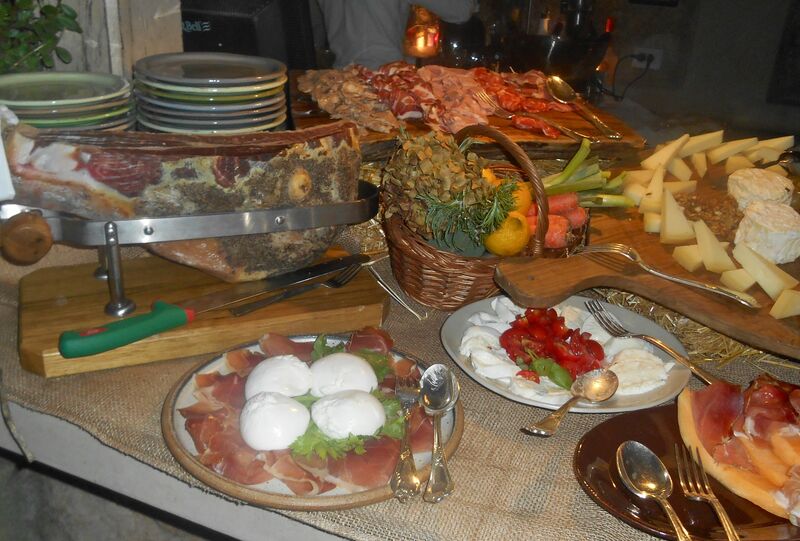 Myriad Italian fare is on display for you to choose from. The spread is simply mind boggling…the advice from one of the waiters: “Try everything.” That would take some doing. After polishing off as much antipasto as you can muster, it’s time to choose your meat or fish (or both, or many) which is then barbecued for you. 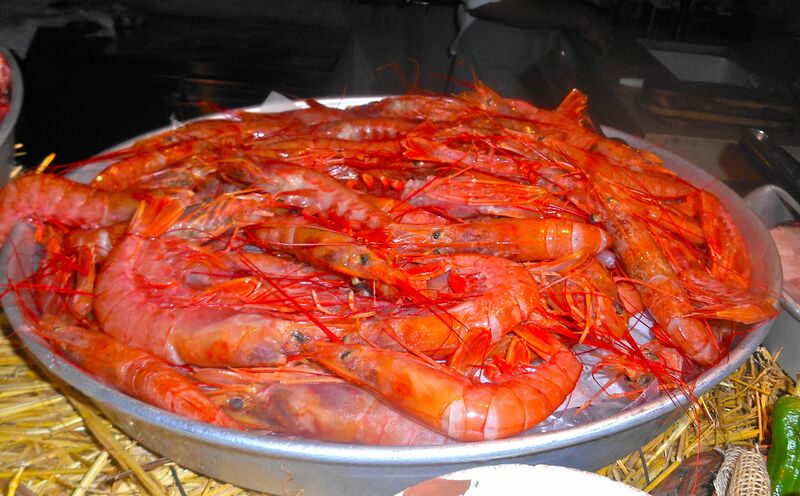 The Iberico pork was stupendous, as were the huge, juicy red prawns. 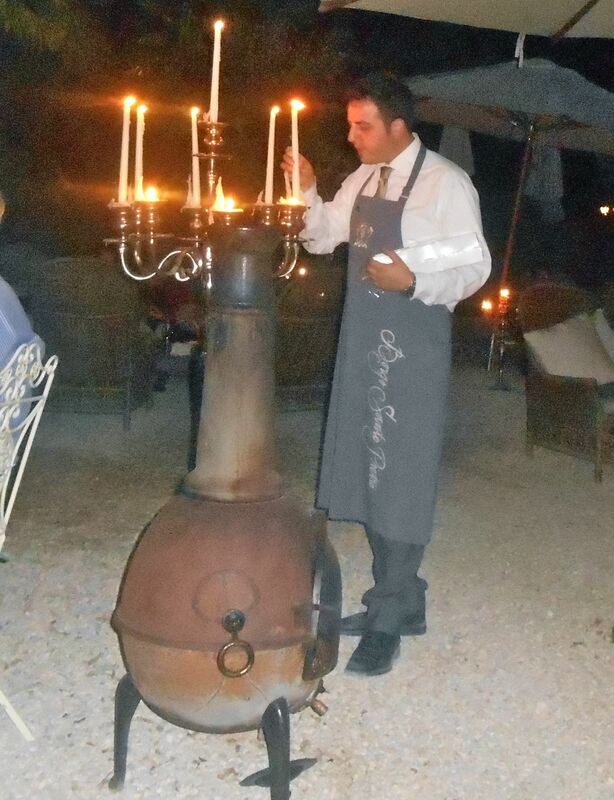 The magical eating area is sprinkled with chimeneas and their warming fires and giant candelabras with candles regularly replenished. Perfect. Restaurant Serena is named after the valley it overlooks. 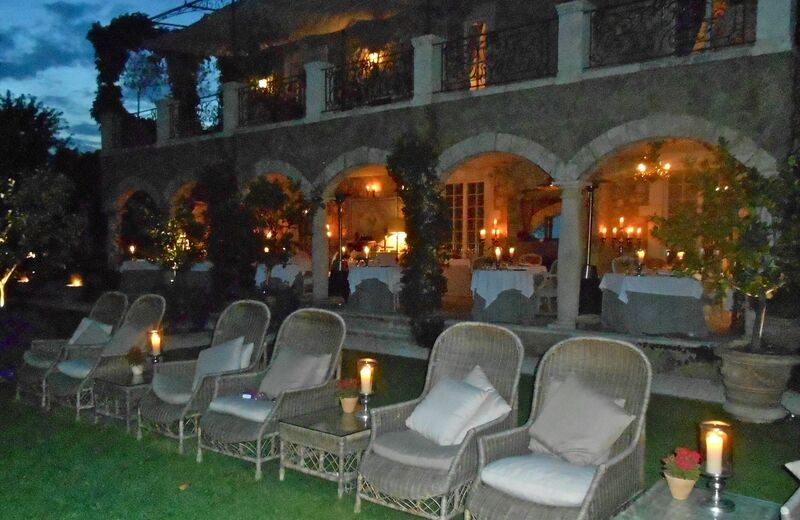 A magical setting for dinner with fabulous food to match. First up, something from the chef arrived. 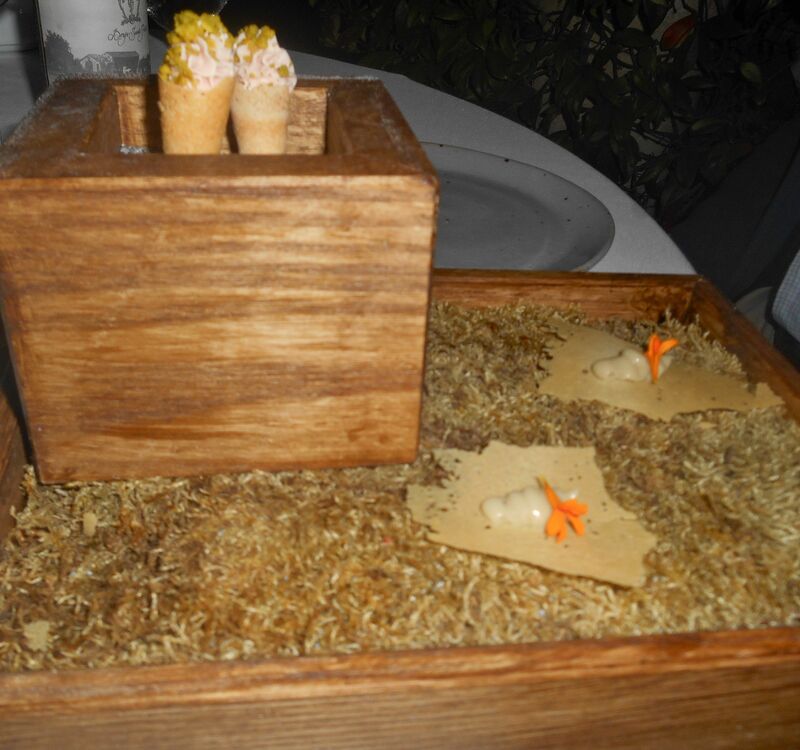 Amazingly creamy mortadella paste (who’d have thought of making mortadella into a paste, it’s genius) served in little mini cones and crunchy Parmesan crisps on a bed of hay. 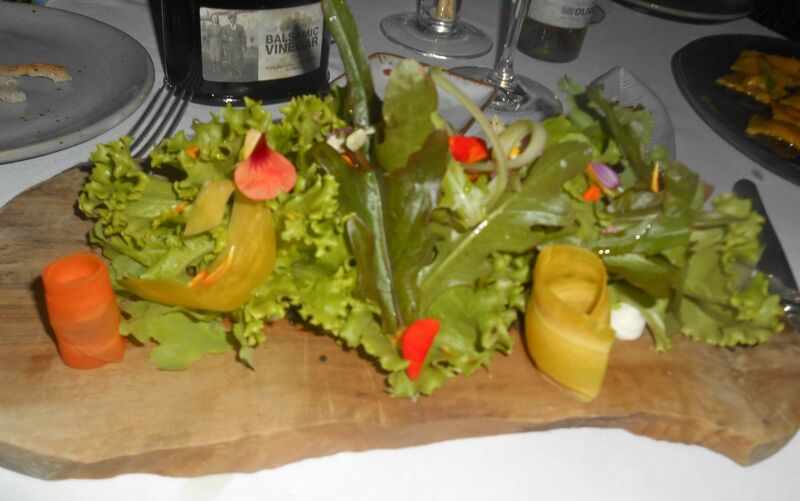 One of the starters was a garden salad, made using ingredients from Borgo’s very own garden. Here’s a test, I thought to myself…and ordered it with anticipation. This beautiful board appeared and our waiter informed us the salad was made up of 26 ingredients…test passed with flying colours. But then what was I expecting? 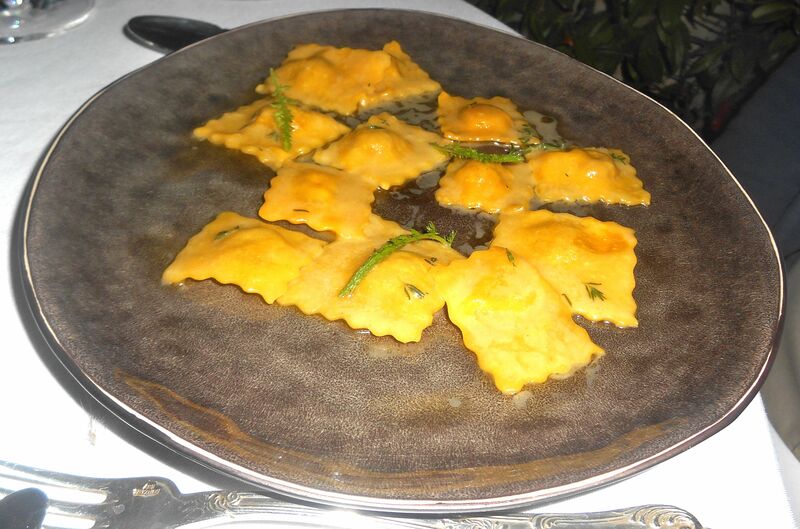 The duck ravioli was mouth-watering with the richness of the duck, freshest of pasta and a smooth herby butter. 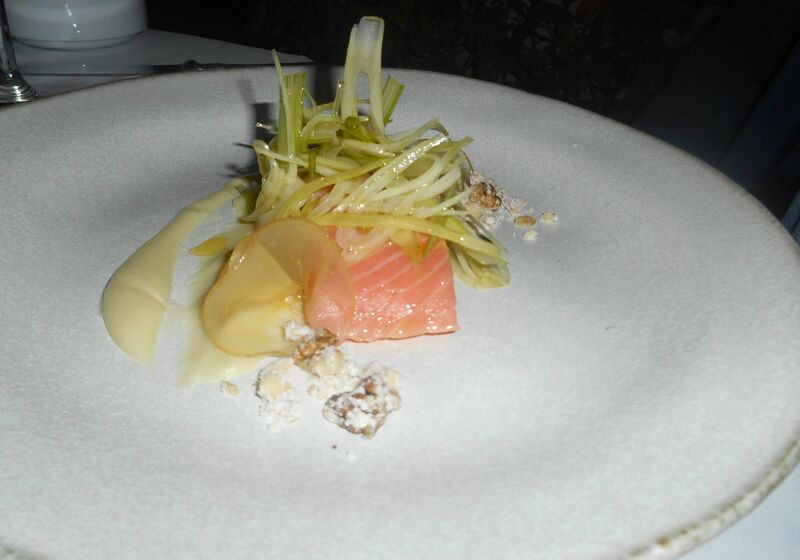 Salmon came perfectly pink inside with crunchy fennel. 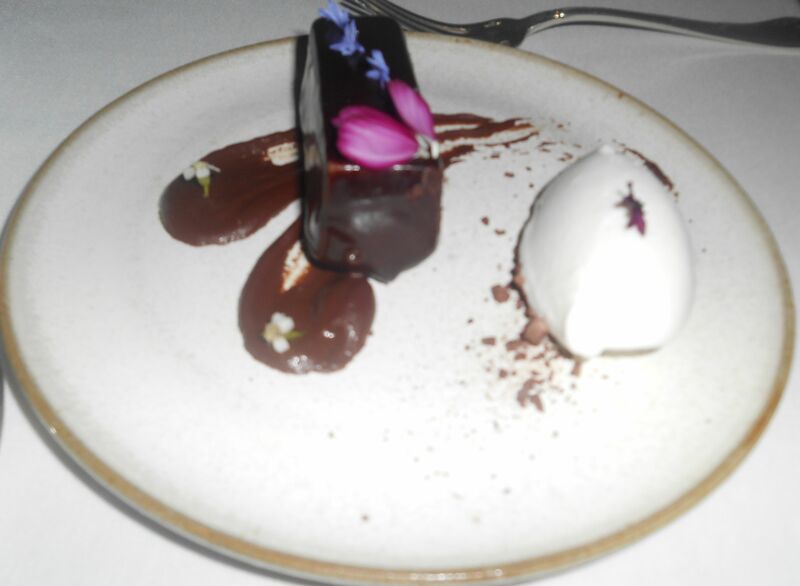 Time for dessert and a stunning chocolate treat with light, yet rich ice cream. 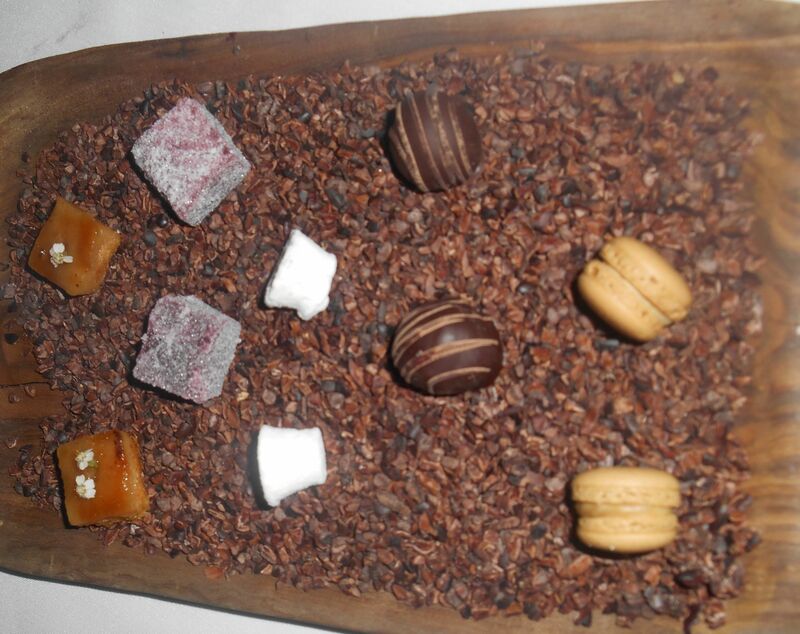 And then a tray of mini-delights to finish off, all laid out on a bed of coffee beans. Baby macaroons, marshmallows, chocolates and jellies. Love the extra surprises that arrive along the way. 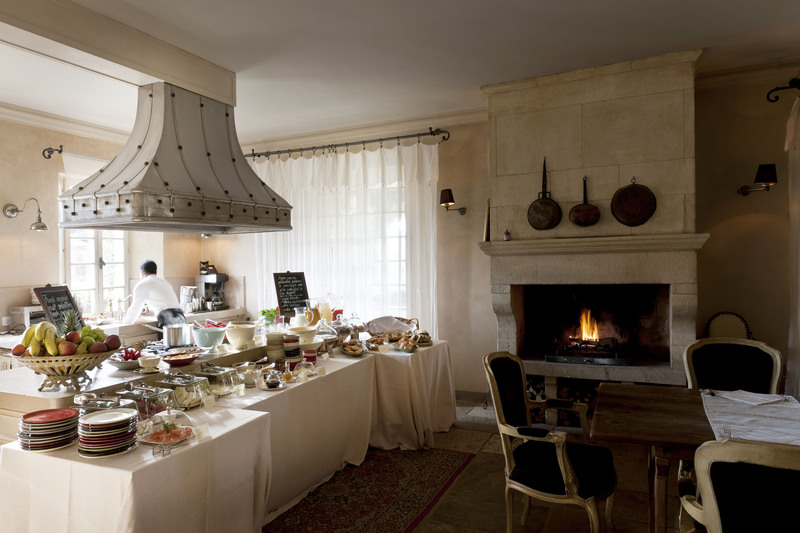 And I mustn’t forget the breakfasts…that ultimate holiday indulgence, and this is one to remember. A spread laid out on the beautiful kitchen counter with fresh fruit, yoghurt, pastries – everything you’d expect – and the most amazing quiches you’ll taste. Plus eggs however you want them. I want this kitchen, too…with its fireplace. Phew, you will eat well at Borgo…no matter what time of day, there’s something delicious waiting to be tucked into.